The team at Your Happy Nest is excited to share some tips on how to manage your social media accounts to help present yourself in the *best* light to your current and future employers. 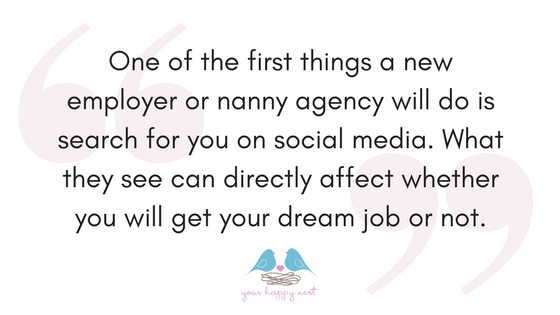 One of the first things a new employer or nanny agency will do is search for you on social media. What they see can directly affect whether you will get your dream job or not. Many of us see social media as an outlet, and a way to tell the world who we are personally ... but there is a danger in sharing TOO much. Because of that, we want to offer you some advice on how to get your social media accounts to work FOR you, not against you. A. Have a polished, professional looking photo as your main picture. B. Share uplifting, positive, cute/funny posts. C. Share photos of your volunteer work, outdoor adventures, and other positive life stories. A. Strong political statements or rants. B. Photos of partying, showing alcohol or other excessive behaviors. And MOST importantly: Never post photos of your charges without permission from the parents, and never share your location while you are working. If you have any questions about this always talk to your current employer about their wishes concerning photos of their children. Follow these tips to maintain a positive social media presence and you are certain to be on your way to success!